Reduces pain and improves patellofemoral function. Less bulk / shorter length for patient comfort. The Donjoy Tru-Pull Lite is one of the shortest, low profile patella brace models around. 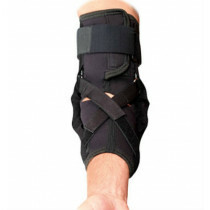 It features a bifurcated strap that dynamically pulls the patella into proper alignment reducing pain. The double thickness rubber buttress provides a stabilizing "pull" against the outside aspect of the patella for a consistent corrective force. This ensures proper patellar alignment and consistent off-loading to reduce pain. The Donjoy Tru-Pull Lite has two buttress flaps that direct a more "tru" stabilizing force towards the knee as it repeatedly flexes and straightens out . 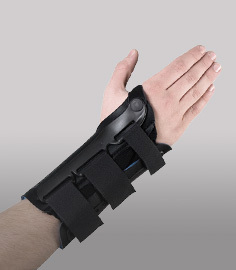 The 8 1/2" length is one of the shortest models around and is perfect for everyone needing to wear a brace daily. The brace is antimicrobial, hypoallergenic, and breathable for total comfort and wicks perspiration away from the area as well. The Donjoy Tru-Pull Lite knee brace is suited for patients with mild subluxation, mal-tracking, patella arthritis, and patellofemoral dysfunction,. Made with Breath-O-Prene®, MicroMesh and Anti-microbial fabrics - Comfortable, lightweight, moisture wicking, hypoallergenic materials. Semi-flexible nylon hinges stabilize the knee / provide moderate medial/lateral support. Soft and tacky buttress makes contact directly with the skin providing a constant corrective force on the kneecap during athletic activities. Low-profile patella support brace is designed with pull straps above and below the patella (kneecap). Seven sizes available - please see our sizing chart tab above for important measurement guidelines. Patella instability as a result of subluxation/dislocation. Patellofemoral pain syndrome resulting from poor tracking of the kneecap. Made from moisture wicking micromesh material for breathability. Highly recommended and worth the cost Review by Pawla J.
I have a patellar tracking issue with associated femoral patellar syndrome symptoms. I bicycle and play tennis and was having sharp knee pains with certain movements when playing tennis. The last few times playing tennis with the Donjoy Tru-Pull Lite Knee brace I have been able to run uninhibited without pain. Make sure to read the application instructions so that you are wearing the brace correctly. If it feels a bit cumbersome at first don't be discouraged as you will get used to it. This Tru-Pull Lite helped my knee so much now I can walk and go up and down stairs without a problem. Finally a knee brace that works for my knee as I have pattelar pain syndrome. Provides very good stability that my daughter needs. The smaller height is also very good. 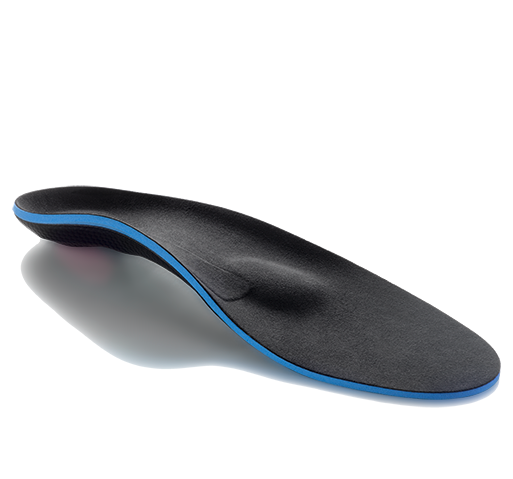 Best I have found, and for the price, it does a great job in relieving my bad knee. I have two of these now because the one I wear to the gym gets used and abused so I need one just for everyday use. Well worth it. The brace itself is very well constructed. You might have to adjust the buttress a little but you can get it just right to prevent a dislocation. Worth it.